A dramatic conclusion to the 2016/17 season saw Harrogate RUFC relegated from National Two North. Dave Doherty’s side went into the final day of the campaign inside the division’s bottom three, but knowing that victory at Hinckley, combined with the outcome of fixtures elsewhere going in their favour, could still see them beat the drop. With the bottom two sides in National Two North and South to be demoted alongside the team finishing third from last with the poorest playing record, there was still all to play for for a number of clubs at 3pm on Saturday. Results in National Two South meant that the side that ended up two places from the bottom of the pile finished on 51 points, a tally that it was impossible for ‘Gate to better, even if they could secure a four-try bonus point victory in Leicestershire. This effectively left them needing to better Sheffield Tigers’ result on the day, the South Yorkshire outfit kicking off one position and one point above them in the table. And although things were looking good for the men from Rudding Lane at half-time with them 17-5 up and the Tigers trailing 17-10 at Luctonians, second-period turnarounds in both games condemned ‘Gate to demotion to National Three North alongside Scunthorpe and Preston Grasshoppers. 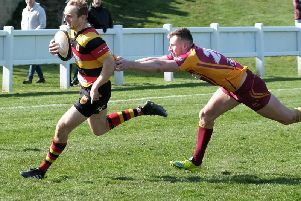 In what was a scintillating contest at Hinckley, Doherty’s men led until the 79th minute when a converted try snatched the narrowest of victories for the hosts. And with Luctonians seemingly in charge against Sheffield it seemed as if the Cockerels might beat the drop until a storming final quarter saw the Tigers claim the ascendancy and pull away for a priceless success. After a fairly even start to proceedings at Leicester Road, the home side were penalised for an offside offence and Sam Fox landed a penalty from the half-way line to put Harrogate 3-0 up. Continued pressure forced Hinckley into conceding a string of penalties and centre Joe Wilson was dispatched to the sin-bin. Harrogate took advantage of the extra man when they scored the first try of the day, directly from a home penalty kick which missed touch. Winger Harry Barnard gathered and ran strongly from deep to set up an attack and the ball was recycled for scrum-half Paddy Hebblethwaite, who dummied and scorched through the midfield for an outstanding 60-metre touchdown. Just two minutes later, Harrogate centre Ben Dixon produced an almost repeat performance. He intercepted a Hinckley pass inside his own half and outstripped the defence for another converted try to make the score 17-0. The homesters then won a turnover from a Cockerels defensive driving maul and full-back Josh Smith squeezed over in the corner to open his side’s account before the half-time break. Harrogate were penalised for an apparent holding offence soon after the re-start and Wilson’s penalty closed the gap at 17-8. The next score arrived after some individual brilliance from Hinckley’s former All Black winger, Scott Hamilton who showed immense skill in gliding through the visitors’ defence for 17-15. Harrogate quickly responded with a strong Sam Brady run and converted try and at 24-15 the away side looked to be back in control. An offside offence then led to a quickly-taken penalty which put Wilson into space for his second try of the day and the gap was narrowed once again at 24-20. A period of Harrogate forward pressure followed with some fine driving play from Tom Harvey and Tim Heaton. Jonny Coser was halted agonisingly close to the try-line but the visitors kept on coming. Hinckley’s defence contained a succession of driving mauls, but the pressure eventually told and Sam Brady crashed over for his second converted try and a 31-20 advantage. The hosts then mounted a spell of forward pressure of their own and second row Ben Marshall’s try made the score 31-25. Disaster then struck for ‘Gate when another Hinckley driving maul led to a Ben Avent try, and the 79th-minute conversion put Hinckley ahead for the first time in the match at 32-31. A few minutes of stoppage time remained and Harrogate attacked desperately to try to regain the lead. In the dying seconds, a Fox drop goal attempt just shaved the outside of the post and the game was over.